Below 65 PSI, pure water will be greatly reduced. Below 35 PSI it won't work well at all. 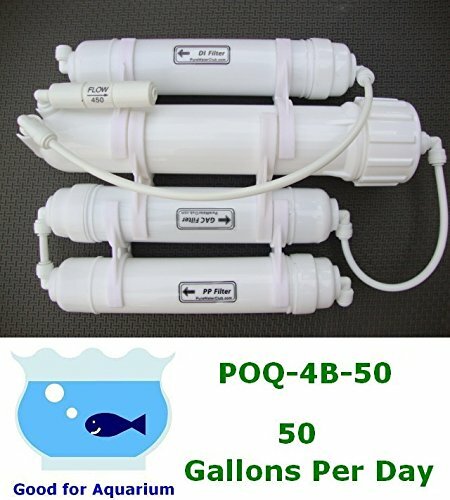 The Pre-filter (1-2 stage) can work for 6-12 months and create the 2000-4000 gallons pure water. The membrane (3rd stage) can work for 24-36 months and create the 54,000 - 110,000 gallons pure water. Di filter works only for 300-400 gallons, to maintain 0 PPM pure water, DI filter must be replaced frequently. DI water is safe for drinking but the taste may differ for everyone; it is usually used for reef water purpose, recommend add one carbon filter after DI when you use it for drinking purpose. We do our best to assist our Buyers with making the RO systems work properly. Any damage during shipping, we will provide new parts/units for exchange. We only make deals with serious Buyers. Please be sure you want the item before making a purchase. If you have any questions about the product, we will happy to answer any question, simply click our company name" DM AQUA INC" on listing page to ask any question. We do NOT offer free, test trials, or similar services. Item return reasons such as "no longer needed", "bought by mistake", and "does not fit my space", will be charged a 15% restocking fee. Items must be returned within 30 days from shipped date. Items must be in BRAND NEW, UN-USED condition, and include ALL parts that came with the original package. We will charge a fee if Buyer fails to return ALL parts in original condition. Actual S&H will be deducted from item prices to reflect freight (includes free shipping items). If you have any questions about this product by purewaterclub, contact us by completing and submitting the form below. If you are looking for a specif part number, please include it with your message.